Alan Melville is far from a household name today, but from the 1940s to the early 1970s he was a prolific writer for both stage and screen. His television credits include The Very Merry Widow (BBC, 1967-1969) and Misleading Cases (BBC, 1967-1971), and for a time he hosted the popular television discussion The Brains Trust (1951-61). ‘One of his gifts,’ his obituary in The Times noted, ‘was to be engagingly topical at short notice,’ (Anon., 27 December 1983, p. 10) and this quality was certainly on view in his 1954 comedy Simon and Laura. The target of his gentle satire was television, which following the broadcast of the Coronation the previous year was rapidly becoming a mass medium. In 1955 the play was adapted as a British film, and almost exactly a decade after its West End premiere it was presented by BBC2 in the Theatre 625 strand with Moira Lister and Ian Carmichael starring. We come over to your home at a fixed hour every night. We so to speak eavesdrop on what you’re doing and saying and thinking. Naturally, it’ll be scripted of course… There mustn’t be anything false or contrived about it. It must be true in every aspect. You see we’re not inventing, we’re not even recreating, we are reporting. There are relatively few theatre plays in which television takes, as it were, centre stage, and Simon and Laura as a play, and then a film, is certainly of interest to the television historian. To see this play then brought to television, as director Christopher Morahan did in 1964, is also intriguing. 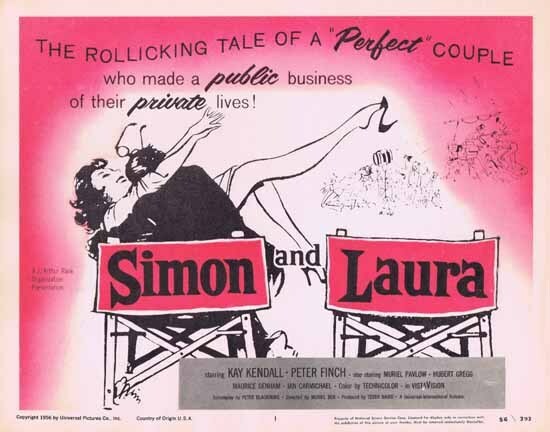 As produced by Murray Macdonald, Simon and Laura opened at London’s Strand Theatre on 25 November 1954. The commercial television service ITV was still almost a year away from challenging the BBC’s single channel. 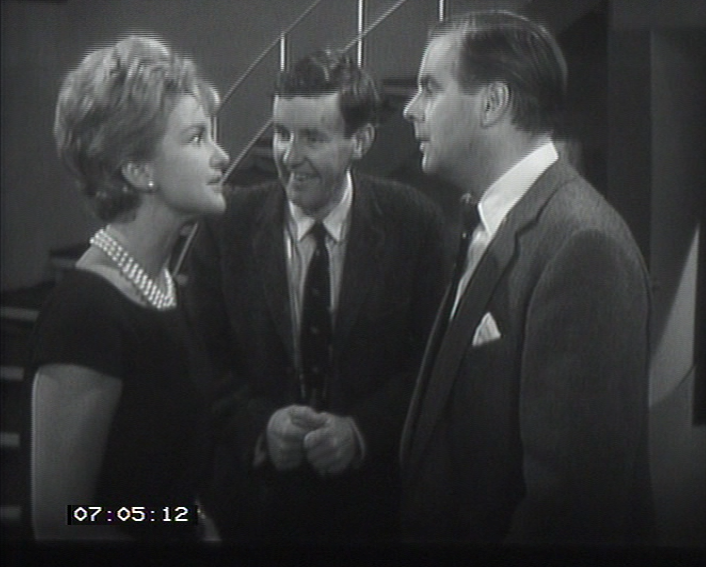 Roland Culver and Coral Browne played the eponymous couple, with Ian Carmichael taking the part of BBC producer David Prentice. Ten years later, on television and less than six months after the start of BBC2, Carmichael was Simon to Moira Lister’s Laura, while Richard Briers had a good deal of comic fun as Prentice. The comedy [Mr Melville] has supplied is not, taken as a whole, a particularly good one, but there are a great many quips which will come home to the business and bosoms of viewers… The performance is curiously like the play, full of amusing things but unsatisfactory as a whole. In the Observer Kenneth Tynan identified a parallel between the basic situation of the play and ‘one of Mr Fred Allen’s popular comedy routines [which] concerns a mutually antipathetic married couple whose income depends on a daily radio programme about marital bliss.’ He was no more enthusiastic about the play than was his counterpart in The Times: ‘As a mechanical tilt at television, the play is acceptable, though the plot is a rattle of dry bones.’ (‘At the theatre’, 28 November 1954, p. 13) Despite the reviews, the show was a success, and on 25 March 1955 a snippet on the front page of the Manchester Guardian recorded that the Queen had seen the production ‘from the front row of the dress circle’ at the Apollo Theatre, to which the production transferred. The industry reacted to the competition in several ways, developing widescreen and 3D formats, and increasing the sophistication of its colour and sound technology. Simon and Laura takes a more direct route: it attacks the similar, but allegedly inferior, medium of television through a farce about a divorcing couple learning to live with each another. The metaphor is simple but perfect. At every opportunity the film delights in exposing television’s cheap production techniques. The infant television world, summarised in Ian Carmichael’s caricatured whiz kid David Prentice, is constantly contrasted with the professionalism of the film industry. Note how the small black and white TV transmissions are always contrasted to the [widescreen process] Vistavision and vibrant Technicolor of the ‘real’ filmic world. 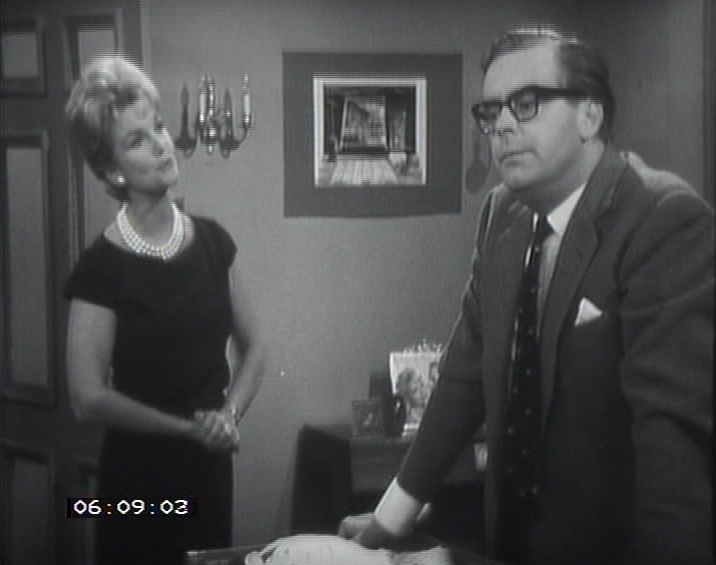 The television adaptation in 1964 returns the play to its theatrical beginnings, for it was recorded on a single extended set in a television studio. The central space is the Foster’s living room which is backed by an elegant staircase down which Ms Lister can make several entrances. Branching off this is a dining room and a hallway, and close by – although not contiguous – is a space in which the production team can set up a control room as well as another room which is needed for Act III. You call that a wonderful job. Three weeks’ rehearsal in a draughty drill hall, technical breakdown in your one big scene, and then your play goes out on BBC2 – no thank you. Both Laura and Simon say no initially, but their agent wins them over to what he promises will be ‘purely a business arrangement’. Their agreement is secured with the suggestions of respective attractions to the young producer and the attractive script writer, Janet (played by Penny Morrell) who appears at the end of the scene. Fade through to Act II in the same set. Act II begins in the chaos of the minutes before the 200th edition of Simon and Laura. Both the housekeeper Jessie and the butler Wilson try to persuade Janet to improve their parts, and we are introduced to an obnoxious boy who it appears Simon and Laura are going to be expected to adopt. But then things begin to fall apart, as both principals accuse the other of affairs with the David, in Laura’s case, and Janet, in Simon’s. A good deal of alcohol is consumed as the final preparations for the broadcast take place around the beginnings of an argument which then breaks out on air as Simon and Laura go off script during the broadcast. On a technical break down taking transmission off-air prevents a disaster, although the Controller of Television rings to offer his congratulations on the best episode to date. We see David in the control gallery but comparatively little is made of the process of transmission. There are gags involving the sound effects assistant shutting doors and ringing telephones. In fact, television technology has a more prominent role to play in Act III when Wilson and the actor playing the boy conspire to record conversations and play them back to others as a means of bringing about a reconciliation between Simon and Laura and bringing David and Janet together. In keeping with the social mores of the day it appears that although both pairings spent the night together, in neither case was a union consummated. One family is reunited at the end of the play, and another newly united. Television, having been an agent of disruption at the start, is revealed to be a force for reconciliation. In the closing shot, coming out of a clinch, Ian Carmichael and Moira Lister look straight into the camera to reassure us of exactly this. Nor is there anything but the most mild critique of any other aspect of television, whether as an institution or as a medium. Alan Melville’s drama may have been seen by the film industry as a weapon in the mid-1950s (although the case for this is probably over-stated in recent literature) but by the mid-1960s the play was just a celebration of comic personas and an excuse for mildly risqué jokes about ‘bouncing about with the BBC in bed-sits’.